by Sr. Mary Bernard Wiecezak, C.S.F.N. August 1, 1993 marked the 50th anniversary of the Martyrdom of our Eleven Sisters of Nowogrodek, Blessed Mary Stella and her Ten Companions. At the time, I was privileged to be residing at our Generalate on Via Nazareth in Rome, Italy. It was a warm Saturday evening as I joined my Sisters in chapel to begin an all-night prayer vigil commemorating this event. I was quite familiar with the heroic tale of these Blessed Sisters, but desired to make this evening’s vigil very meaningful. I had secured a copy of Eleven Prie-Dieux, by Maria Starzynska, and decided to read and reflect upon it slowly and deliberately, reliving every moment of that historic night. We were in the same time zone as were the Sisters that fateful evening, passing from Saturday into Sunday as they did. This made our vigil even more special for me. The Sisters in our Roman convent had erected a tall white birch cross in the sanctuary. Many vine-like plants were artistically arranged at the base, with eleven medium-sized red vigils placed among the vines. As the evening began, we listened as the story of our Eleven Martyrs was narrated over the Polish station of Vatican Radio. Vigils were lighted and then silence prevailed. Slowly and deliberately, I read of the events of that night at the Fara, the local church which the Sisters attended. Evening rosary devotions were shortened by their chaplain Father Zienkiewicz. Sister Stella had told him they were ordered to report to the commissariat of the German Gestapo at 7:30 sharp. Father did not wish them to be late. It was now close to that fateful hour as I accompanied my Sisters in spirit and in prayer to their destiny. “They went in pairs, in their black habits and veils, with their white collars Sisters: Stella, Imelda, Rajmunda, Daniela, Kanuta, Sergia, Gwidona, Felicyta, Heliodora, Kanizja, and Boromea.” (Eleven Prie-Dieux, p. 42). Sister Malgorzata alone remained behind. My mind raced as I relived those fateful hours of questioning by the Nazis. I imagined I could hear the harsh voice of a German officer and the soft response of Sisters Gwidona and Heliodora who knew the German language. Time moved on as I read that an hour later they were taken out of the building and ordered into trucks. The time of execution had not been a favorable one and so they were brought back to the basement of the building. It is recorded in Mrs. Starzynska’s account that a boilerman who worked at the commissariat reported that traces of outstretched figures could later be seen in the dust on the floor. More than likely the Sisters had spent the night in prayer, waiting for their executioners to determine their fate. The clock slowly ticked on, and silence once again prevailed. About 3:30 a.m. I knew in my heart that the hour had arrived when our beloved Sisters were led out once more into the trucks to take them to their place of execution. No words can describe the emotion that filled my heart. 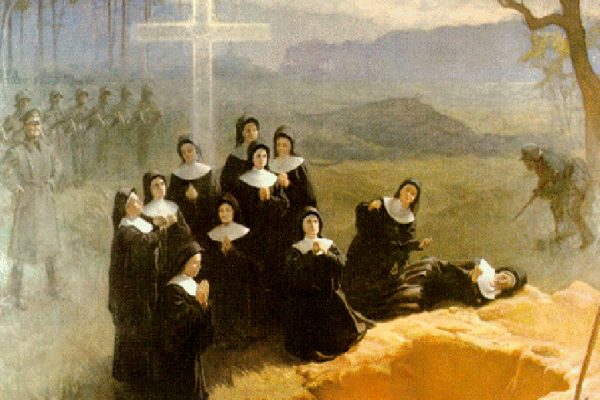 I imagined the sounds of the gunfire, as one by one these saintly women went to meet their death. Night had fallen and I sensed the silence of the forest in Nowogrodek. By now my mind was completely overwhelmed by all I had lived through during those hours of prayer and reflection. But, the most meaningful event was yet to occur. Perhaps, I was emotionally exhausted, but in my heart I felt I was to experience something not of this world. As the sun came up that Sunday morning, my eyes were still fixed on the eleven vigils that had been burning through the night. They were not completely spent. Our chapel welcomed the light of a new dawn that morning of August 1st. One by one the eleven vigils extinguished themselves! I knew it was a sign from our beloved Martyrs that they truly had entered their eternal reward. I felt their presence around me as I thanked them for the sacrifice of their lives. It had been a truly magnificent and mystical experience to spend that night in prayer and reflection, but more so to witness the miraculous extinction of the eleven vigils signaling the glorious entry of Sisters Stella, Imelda, Rajmunda, Daniela, Kamuta, Sergia, Gwidona, Felycita, Helidora, Kanizja, and Boromea into heaven. A group of Polish boy scouts had been going through the forest on the morning of August 1, 1993. Seeing the crowd of Sisters, priests, and laity assembled there they looked on with curiosity. A young man approached one of the Sisters and gave her a small crucifix which he had found that morning in the grass. It is believed to have been one belonging to one of the Martyrs. Mother Maria Teresa Jasionowicz, our Mother General at the time, brought that same crucifix back to our convent in Rome. How privileged I felt as I held and kissed it.